Noble and elegant through the city, safe in the narrow curves of the pass roads and robust off the road across fields and through the forest. Explore regions! We present regions and their highlights. Discover your favourite trails, tracks, routes and tours all over the world. In the middle of nature, you can experience great adventures and memorable moments. The word "Tour" derives from the French word for "round trip". In our opinion, there is no better translation for it. All of our tours are little journeys that offer unforgettable experiences and fantastic outdoor adventures. And since the selection of tours can never be large enough, you can find more than enough tour suggestions along with pictures, route gradients, topographic maps and detailed directions. Simply choose an activity from the column "I'd like to go...", add a region of your choice and let your adventure begin! On Outdooractive, we have tours for every type of outdoor activity you could possibly imagine. We offer trails, tracks and routes for hiking, as well as long distance trails. Climbers and mountaineers will be delighted by challenging mountain tours, fixed-rope routes or alpine glacier climbs. 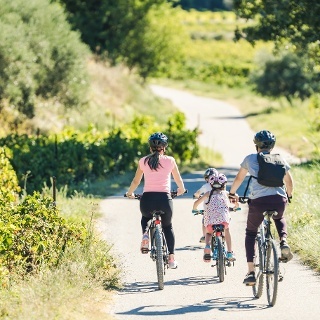 Cyclists will find an endless amount of family-friendly bike rides, road bike routes, mountainbike trails and transalp tours. Enjoy our tours and be outdooractive! What kind of tour is suitable for you? Which special highlights are there to discover? And what kind of information do you need to plan your perfect trip? Outdooractive gives you the right answers. Along with recent photos, detailed route descriptions and important data, every tour description written by the Editorial Division contains precise GPS-tracks and notable points of interest. Our partners in tourism create the most recommendable tours in their regions thus providing a lot of assistance during the planning process of your next vacation. A major part of all Outdooractive tours was created by our lively Community. With the help of our route planner, it is easy to upload your own tours and share it with other users. Be part of Europe's largest outdoor platform and show others the most beautiful parts of your region. As an active Community member, you are able to download tour content for free, print it or load it onto your smartphone or GPS device. Additionally, you can leave comments and rate tours written by other Community members. Register now and become part of an active outdoor community!